Indianopolis, IN - Glory be to God; thanks be to the Theotokos and the saints; health, prosperity and salvation to all of the faithful. 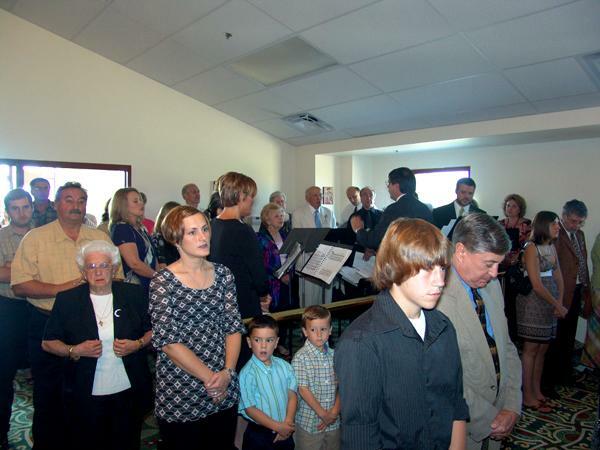 The dedication of our new St. Nicholas Church and fellowship hall took place September 21-23, 2007. The weekend was awesome. In fact, it was the most memorable weekend ever in the history of this parish. It all started with the welcoming of His Grace Bishop Longin on Friday evening for the Akathist service in front of a myrrh-streaming icon of the Mother of God. This icon, which recently began flowing myrrh, was jointly commissioned in the year 2000 by the Orthodox Churches of Central Indiana, and many of their clergy were present on Friday: Fr. Nabil Hanna of St. George Church, Fr. Stevan Bauman of Joy of All Who Sorrow Church, Fr. David Wey of Sts. Constantine and Elena Church, V. Rev. Stephen Rhudy of St. George (Terre Haute) and Fr. Joseph Gibson of St. John the Forerunner Church. The nuns of St. Xenia Metochion Monastery and at least 80 souls, most of whom are our parishioners, were also present. After the service we had time for fellowship and, thanks to our dear sisters, a variety of foods to munch on. At 8 p.m. our bishop, some of the clergy, and the past parish council presidents who are presently active in Church life gathered at the home of Rick and Kim Suder for their Slava celebration. There, after a royal meal, the past presidents and I met with the bishop and asked for a blessing to establish a symbolic building committee to dream and very, very slowly work on gathering information for the building of a Srbo-Byzantine style church sometime in the future. I hope and pray it doesn’t take too long, but the building committee for our present Church which we just dedicated was first established on January 5, 1958. Saturday morning Bishop Longin met with Parish Council President Robert Ivancevich for a personal tour of the building and grounds, and they looked at where on our corner sign to place the date of our establishment as a parish and the official name of our Church. At 4:30 p.m. our bishop was greeted at the Church doors by many priests (Fr. Radomir Chkautovic, Fr. Tom Kazic, Fr. Nabil Hanna, Fr. Petar Petrovic, Fr. Mihailo Mikic, Fr. Joseph Gibson, Fr. Alexis Miller, Fr. Marko Matic, and Fr. Mile Subotic) and Vespers started. If you were not there, you missed something big. The Church was packed and overflowing with the faithful. The Choir, as on Friday and also on Sunday, was without a doubt the best ever. The voices were angelic and the timing was professional. Choir director Bill Christoff and Cantor Dylan Jensen did an outstanding job making sure everything flowed. The bishop was sitting in his throne until the troparia; at that time the priests came out of the Altar, and the bishop came to the center of the Church. The Vespers ended and the service of “The Blessing of the New Home” continued. At the end of the service the bishop individually blessed the priests, monastics, and kumovi (the Stanjevich family and Suder family), but the rest of the faithful he signed with the sign of the cross and dismissed into the fellowship hall because of the multitude of people and for the sake of the schedule which we were trying to follow to the best of our ability. In the fellowship hall the Indianapolis Children’s Choir provided a great surprise by singing “Boze Pravde” (the Serbian national anthem) by heart; people cried. During the hour and a half of fellowship that followed, our parishioner Biljana Bozinovska played the cello, and our tamburitza group led by Dylan Jensen also performed – another great surprise and job well done! The Sunday School Children, led by their wonderful and dedicated teachers and the youth, performed a song [included in this article] which they composed. It was just amazing. 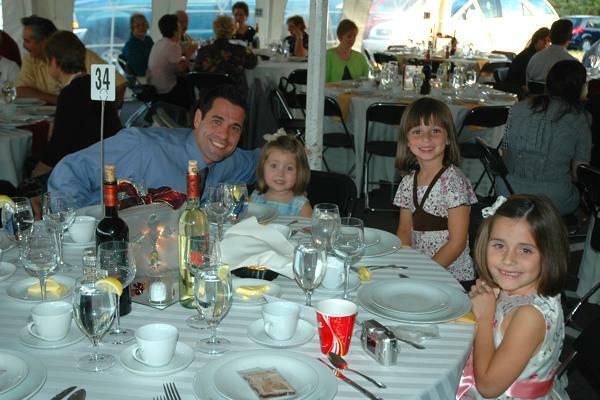 At 7:30 p.m. the banquet began. I should mention that the Church on this day smelled, looked, and felt unbelievably holy and sacred, the fellowship hall someone said compared to the midnight buffet on a cruse ship, and the set-up under the tent was like that of a 5-star restaurant. The weather, too, was absolutely perfect. The playground behind the Church was filled with children, and the 10-acre field was packed with cars. Over 400 souls were under the tent. After the banquet the bishop gave Grammatas to all of the past parish council presidents (Bob Ivancevich, Milan Milivojevic, Rick Suder, Vera Schuster, Stephen Staletovich, Robert Foreman, Mirko Milivojac, Dorothy Milivojac, Jim Tasich, Dimitrije Gracev, Chet Tasich, Ivan Jakovljevich, Marko Radovanovich, Mane Bubalo, and Milo Cvetkovich) for leading the people towards the realization of the dream. The past priests (Fr. Alexander Milhailovich, Fr. Mihailo Mikich, Fr. Radmilo Stokich, Fr. Radoslav Filipovic, Fr. Borislav Jegarski, and Fr. Andrija Dimitrijevic), departed priests (+Fr. Varnava Jovanovich, +Fr. Stoilo Ilich, +Fr. Dushan Petrovich, +Fr. Vladomir Milinkovich, and +Fr. Zivoin Zdravkovich), and departed past presidents (+Todor Stanjevich, +Vaso Kresojevich, +Steve Petrovich, +Savo Kresojevich, +Robert Medich, +Rade Popovich, and +Sam Salatich) were recognized in prayer the next day during Divine Liturgy. May their memory be eternal. 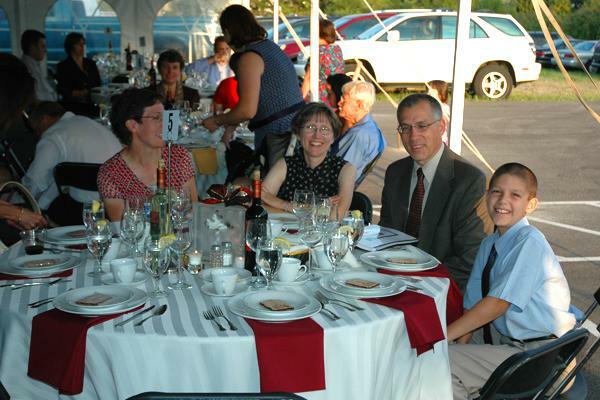 Also recognized were the special guests at the head table: our dean V. Rev. Stavrophor Radomir Chkautovic, National K.S.S. President Mira Andjelkovic, Vice Counsel of Bosnia Herzegovina Mr. Marinko Avramovic and State Senator Mike Delft. Our honorary kumovi (our elders) were recognized as well: first president Milo Cvetkovic and his wife Sofia, Mane Bubalo, Yovanka Savich, Angie Devitt, Scotty Grant, Milos and Yftimia Cvetinovich, Bogdan and Dorothy Milivojac, Ed & Dragica Kerr, Leona James, and Helen Maric. Very much worthy of special mention are Bogdan and Dorothy Milivojac. 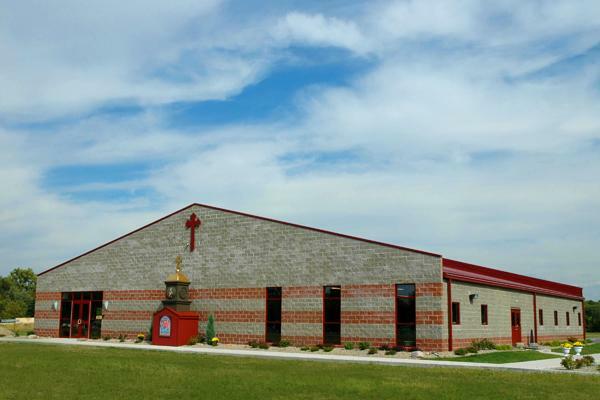 They gave our building project a jump start, just as South Bend once gave us a jump start in organizing our parish, by taking a second mortgage of $50,000.00 on their home to pay off our land so that we could start building and now be in our new home. Thank you! Special thanks to our brothers and sisters from Gary, South Bend, St. Louise, Cincinnati, Chicago, Michigan, Windsor … who came all the way to Indy to celebrate with us. God bless you. There were quite a few other people who were not recognized – who work behind the scenes – and we take this opportunity to thank you, our dear brethren. May God reward and recognize all of us at the Great Judgment. The banquet was crowned by a dance till midnight in our fellowship hall. The weekend, however, was crowned by the Divine Liturgy on Sunday morning. Prior to the service the new Altar Table was consecrated. The K.S.S. Slava and anniversary celebration followed the Liturgy. Thank you, dear sisters, for all you do. Of all the blessings for our community this weekend, the greatest were the presence of a particle of the Life Giving Cross, the myrrh-streaming icon of the Mother of God, and the fact that the relics which were placed in the Holy Table were of the Holy Serbian King Lazar (14th century) who gave his life for the Precious Cross and the Golden Freedom.